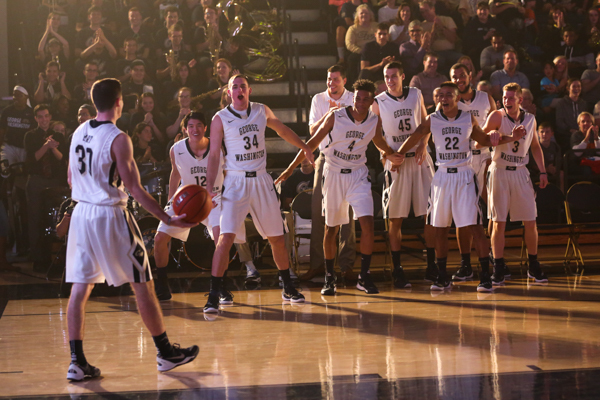 The men's basketball team reacts after redshirt junior Matt Hart makes a one handed dunk in the dunk contest. Around the District last weekend, college basketball programs tried to build anticipation for their upcoming seasons, hosting pep rallies for students and fans. Georgetown brought in rapper 2Chainz and Maryland head coach Mark Turgeon emerged mid-court from under the cover of darkness. At GW, the event became a family affair as part of Colonials Weekend. But before the lights dimmed in the Smith Center, organizers, athletes and student groups of all kinds had to put it all together. Here’s how it all happened. The central purpose of Colonials Invasion is, of course, to introduce the men’s and women’s basketball teams for the upcoming season. Beginning last year, Marketing and Events Coordinator Lauren Turosik said, the marketing department decided to secretly coordinate with family, friends and, sometimes, dogs of each player to record video introductions to play on the big screen. “A lot of them don’t know that it’s happening, so their reactions are really genuine and really sweet. A lot of them tear up because their parents aren’t able to come for Colonials Weekend because they’re from a different state, from a different city, whatever. And so when they see them up there, they hear them or their siblings or their friends. I think it’s a really special, organic moment that is really great for our players,” Turosik said. Some family members made it into the show live, as well. Junior Kate Bell, dubbed Commander-in-chief of the Colonial Army, took center court to tell the crowd about the group’s plans for big games, but was interrupted when her mother, enacting every college student’s greatest fear, walked out in front of a giant audience of her peers holding a microphone. 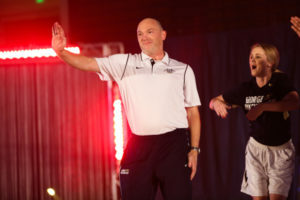 Women’s basketball coach Jonathan Tsipis joins his team in a choreographed dance routine. A few members of the men’s basketball team treated spectators to a dunk competition. The 6-foot-1 Matt Hart, a redshirt junior who will see the court for the first time this season after transferring from Hamilton and sitting out a year, showed off his impressive hops along with Yuta Watanabe and Patricio Garino. Garino was ultimately the winner after two rounds of competition. After forward Kevin Larsen made a few failed attempts at setting Garino up by rainbowing the ball in the paint (Larsen is a great passing big, but should stick to basketball as a set-up man), Wake Forest transfer Tyler Cavanaugh came in to save the day. Garino leapfrogged Cavanaugh and buried the ball sporting a retro Pops Mensah-Bonsu jersey. Mensah-Bonsu played at GW from 2002-2006 and retired from a successful professional career in Europe on Oct. 14. Colonial Brass set the tone of the evening, playing spectators into the arena and leading the crowd in singing the fight song. But Allen Shult, teaching assistant for the band, said that they have a wider array of song selections this year. “We’re excited to bring back Bohemian Rhapsody into our repertoire, should be fun to play at some pregames during the basketball season,” Schult said. While they normally split up duties, the First Ladies dance team and GW Cheer combined for a routine during Colonials Invasion, which spirit coordinator and head dance team coach Kate Southall said she started choreographing in August. “We’ve been learning it ever since, and so since it’s cheer and dance we kind of have to, myself and the cheer coach, have to work together to coordinate and figure out the whole routine. And we kind of smashed it together in the last three weeks or so,” Southall said. Women’s basketball head coach Jonathan Tsipis was calm amid the hype, saying that he still had plenty of time left to finish preparing for the season. Capital Funk performs a dance routine during Colonials Invasion. The group performed an elaborately choreographed dance routine that got the crowd (and Tsipis) out of their seats. Tsipis also said that he appreciated the evening as a chance to connect with different student groups and show that the team doesn’t just expect fans to come to them, they want to be an active part of the community. His men’s team counterpart Mike Lonergan was equally enthusiastic about the student group performers, like Bhangra and Capital Funk, but had a slightly more simple take on the event as a whole. “I’m just glad nobody got hurt,” Lonergan said. This article appeared in the October 22, 2015 issue of the Hatchet.